Synthetic peptide within Human Neutrophil Elastase aa 250-350 (C terminal). The exact sequence is proprietary. Our Abpromise guarantee covers the use of ab131260 in the following tested applications. See protocols IHC antigen retrieval protocols. ab131260 staining Neutrophil Elastase in Human bone marrow tissue sections by Immunohistochemistry (IHC-P - paraformaldehyde-fixed, paraffin-embedded sections). Tissue was fixed and paraffin-embedded, antigen retrieval was by heat mediation in Tris/EDTA buffer pH9. Samples were incubated with primary antibody (1/5000). An undiluted HRP-conjugated mouse anti-rabbit IgG was used as the secondary antibody. Tissue counterstained with Hematoxylin. PBS was used in the negative control rather than the Primary antibody. 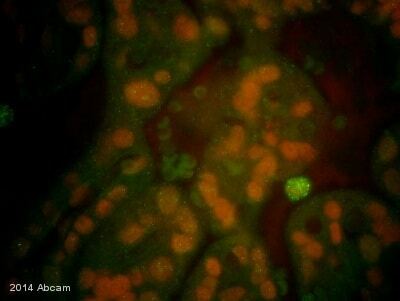 ab131260 staining Neutrophil Elastase in the HL-60 cell line by ICC/IF (Immunocytochemistry/immunofluorescence). Cells were fixed with 4% Paraformaldehyde permeabilized with 0.1% Triton X-100. Samples were incubated with primary antibody (1/70). ab150120(1/500) an Alexa Fluor®594-conjugated Goat anti-rabbit IgG was used as the secondary antibody. Nuclei were counterstained with DAPI. ab131260 staining Neutrophil Elastase in Human spleen tissue sections by Immunohistochemistry (IHC-P - paraformaldehyde-fixed, paraffin-embedded sections). Tissue was fixed and paraffin-embedded, antigen retrieval was by heat mediation in Tris/EDTA buffer pH9. Samples were incubated with primary antibody (1/5000). An undiluted HRP-conjugated mouse anti-rabbit IgG was used as the secondary antibody. Tissue counterstained with Hematoxylin. PBS was used in the negative control rather than the Primary antibody. Immunohistochemical analysis of paraffin-embedded Human bone marrow tissue labelling Neutrophil Elastase with unpurified ab131260 at 1/250 dilution. Overlay histogram showing HL60 cells stained with unpurified ab131260 (red line). The cells were fixed with 80% methanol (5 min) and then permeabilized with 0.1% PBS-Tween for 20 min. The cells were then incubated in 1x PBS / 10% normal goat serum / 0.3M glycine to block non-specific protein-protein interactions followed by the antibody (ab131260, 1/100 dilution) for 30 min at 22°C. 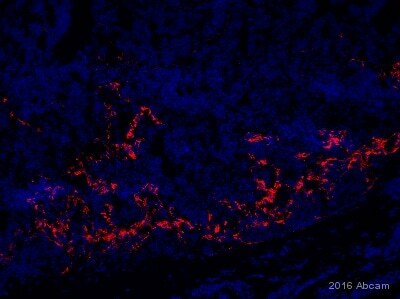 The secondary antibody used was goat anti-rabbit Alexa Fluor® 488 (IgG H+L) (ab150077) at 1/2000 dilution for 30 min at 22°C. Isotype control antibody (black line) was rabbit IgG (monoclonal) (1μg/1x106 cells) used under the same conditions. Unlabelled sample (blue line) was also used as a control. Acquisition of >5,000 events were collected using a 20mW Argon ion laser (488nm) and 525/30 bandpass filter.